This Pride weekend, people who walk into the Black Cat on Sunset Boulevard, which opened in late 2012, may wonder about its name. They’re surprised when the staff, which knows the history, tells them about the police raid on the original Black Cat and its gay patrons on New Year’s Eve 1967 and the protest that followed six weeks later. Far from being unlucky, they learn, the Black Cat in Silver Lake is the site of an important moment in the LGBT history of Los Angeles. 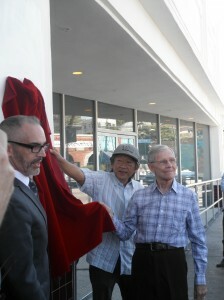 A plaque acknowledging the Black Cat’s role in LGBT history was unveiled Tuesday by LA Councilmember Mitch O’Farrell, left; Wes Joe of the Friends of the Black Cat, center, and Alexei Romanoff, right, who was present at the 1967 protest. February 11, 1967 is not a date that’s widely heralded as significant in the fight for LGBT civil rights. In the popular consciousness, it doesn’t rival June 28, 1969, the day of the famous Stonewall riot in New York City, which is widely regarded as the beginning of the modern LGBT rights movement. But in truth the 1967 Black Cat protest is the older sister — the Jan Brady to Stonewall’s “Marcia, Marcia, Marcia” — of Stonewall. And in Southern California, its claws ran deep and left their own indelible mark. It was the first time that LGBT people in the United States organized a protest against police persecution. The raid and the arrests that accompanied it inspired the first legal argument that gay people were entitled to equal protection under the law. The Black Cat is at 3903 Sunset Blvd. at Hyperion Avenue. In the late 1960s it was one of a dozen gay bars along a one-mile stretch of Sunset ending at Sunset Junction. Lillian Faderman, a co-author of ” Gay LA: A History of Sexual Outlaws, Power Politics and Lipstick Lesbians,” recalled her bar experience in a 2008 speech. “I came out in the 1950s, at a time when lesbians and gays were made to feel like outlaws by society, and especially by the Los Angeles Police Department,” she said. That was the case on New Year’s Eve 1967, when a dozen undercover vice officers positioned themselves in the crowded Black Cat. Highland described the scene in a gay magazine called Tangents: “Midnight came. 1967. ‘Happy New Year!’ A bartender pulled a string and the balloons showered down. The Rhythm Queens yelled a jazz-rock version of “Auld Lang Syne.” Noisemakers squawked. Confetti flew. Kissing is a New Year’s Eve tradition. Did it happen here? If so, it didn’t go on for long,” he wrote. “[A bartender] went quietly … Maybe not so quietly, but others went too. A dozen of them. For the most part they were the transvestites. The police were trying to build a case. If drag is no longer illegal, juries tend to think it should be. To the public mind it suggests degeneracy. A youth in taffeta, forced to bend across the hood of a patrol car, tore the paper leis from his neck and dropped them into the gutter. They were for happy times and this was not. Two of those arrested, Charles Talley and Benny Baker, were convicted of lewd conduct and filed an appeal. Vice cops had seen them kissing other men, Baker while wearing a white dress. The U.S. Supreme Court declined to hear their appeal, but their attorney, Herbert Selwyn, set a precedent by arguing that they should have been granted equal protection rights under the U.S. Constitution’s 14th Amendment. Romanoff wasn’t in the Black Cat that New Year’s Eve. But he was one of the people who, in the wake of the raid, decided it was time to fight. He may be the only person from the protest still living. Romanoff’s husband, David Farah, 55, said that word went out in the community back when the Black Cat was dedicated as a historic site. Besides Romanoff, the only person found was Aristide Laurent, who was too sick to attend the dedication and who died in 2011. “We would love to know anyone else, too,” Farah said. Reports vary on the number of people who attended the protest. Romanoff estimates there were 300 to 600 people there. The demonstration was planned by a group called P.R.I.D.E. (Personal Rights in Defense and Education). A Hollywood bar owner agreed to let P.R.I.D.E. organizers meet in the bar during hours when it was closed. A phone tree was set up, with each person calling 10 or 20 others. People were nervous and feared further violence from the police. That’s why the protest didn’t happen until weeks after the New Year’s raid. That’s also one reason protests were planned in communities other than the LGBT one. The organizers tried to coordinate simultaneous rallies in black, Latino and other minority communities. The strategy was to spread police forces thin with demonstrations across various parts of the city. A letter signed by Jim Kepner, curator of the National Gay Archives (now the ONE Archives), mentions the simultaneous rallies. “The Black Cat attack outraged gays and many others as well,” Kepner wrote. 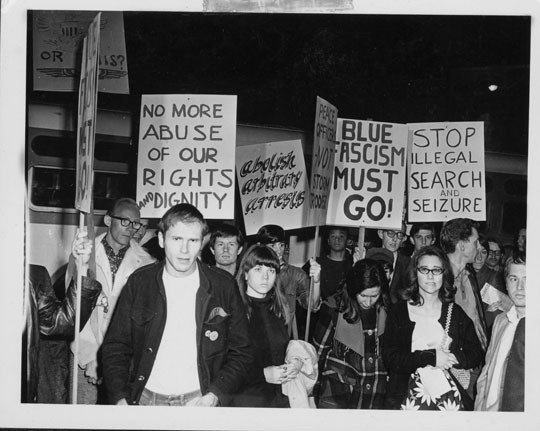 “On February 11, a protest was organized outside the bar by PRIDE, first gay organization largely oriented toward the bar community, and coordinated with similar protests on the Sunset Strip (where Sheriffs were beating hippies nightly for the 6 o’clock news), Watts, Pacoima and Boyle Heights. The overall coordinators howled at the word ‘homosexual’ on our leaflets, so, under pressure, we avoided mentioning our name during the rally, but swore that ‘the love that dared not speak its name’ would never again be silenced. Forty people marched in the picket line, and two hundred of us (and fifty incredibly armed police) participated in the rally in the lot east of the bar. We passed out 3,000 leaflets, chiefly to persons driving by who promised to join us next time. In a newsletter for the Southern California Council on Religion and the Homophile, Kepner described the scene in court where Baker, Talley and others were on trial.